Butcher's Broom (Ruscus Aculeatus) Other Names: Balai du Boucher, Box Holly, Fragon, Fragon Épineux, Fragon Faux Houx, Fragon Piquant, Houx Frelon, Jew's Myrtle, Kneeholm, Knee Holly, Petit Houx, Pettigree, Sweet Broom, Rusci Aculeati, Rusci Aculeati Rhizoma, Rusco, Ruscus aculeatus. The herb called the butcher's broom refers to a short evergreen shrub - botanical name Ruscus aculeatus L., belonging to the plant family Liliaceae, this plant is fairly common in this country and is known by other common names - the box holly and the knee holly. The butcher's broom itself is a transplanted species and was originally a native plant found around the entire Mediterranean region from the Azores all the way to Iran in the Persian Gulf. The traditional and historical use of the butcher's broom herb is also a long one and many cultures in areas where the plant grew native used it in a variety of herbal preparations. The use of the butcher's broom as a diuretic and laxative herb was suggested by the ancient Greek herbalist Dioscorides as early as the first century. Nicholas Culpeper, the most famous of the herbal apothecary astrologer of the seventeenth century, recommended making an herbal decoction of the butcher's broom root for drinking, this internal potion was to be used along with an herbal topical poultice made from the berries and the leaves to hasten the knitting of broken bones in people with fractures. While the effectiveness of this combined treatment is not known, it is seldom listed in the standard references on herbal medications due to the fact, that this treatment strategy never did gain any recognition or popularity in either Europe or the United States and most herbalists ignore the method suggested. At this time, in the United States, butcher's broom herbal capsules, each of one contains 75 mg of the broom extract and 2 mg of rosemary oil are available in many health food stores and herbal stores. There are campaigns directed towards the general public and the slogan "a proven European herbal formula, said to improve circulation in the legs," is how one particular product is being advertised by the promoters. The marketing campaign for another such product makes the assertion that "millions of Europeans report it works wonders-particularly for women who often complain about a 'heavy feeling' in the legs", some of these claims can clearly be seen to be marketing gimmicks and cannot be trusted. In addition, the butcher's broom is a rather common plant and the claims by marketing promoters of it being a "rare" herb or it being very "hard-to-find" are patently false. Some of the benefits associated with the herbal products are however true and the plant can be used in the treatment of a variety of conditions. 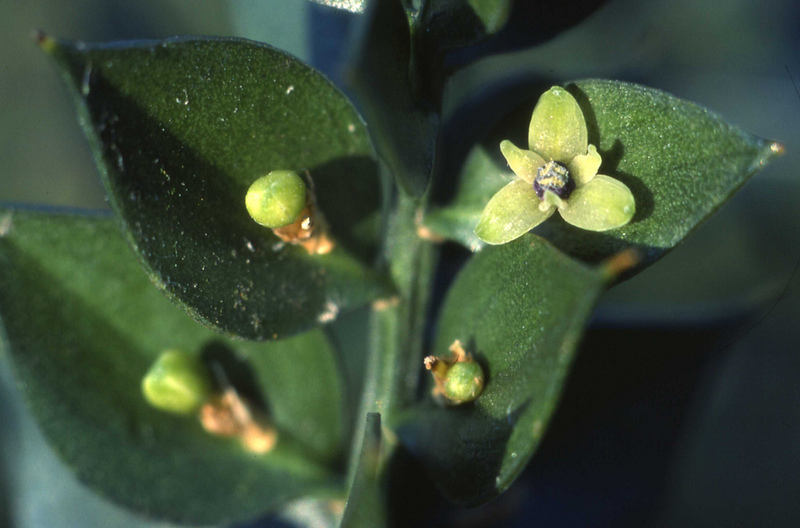 Many areas in Europe, western Asia, and North Africa have native populations of the butcher's broom and the plant is cultivated in some of these places. Butcher's broom grows in the wild on uncultivated and non agricultural lands as well as in woodlands, in many countries the butcher's broom is a protected species as wild varieties of the plant have become rare. 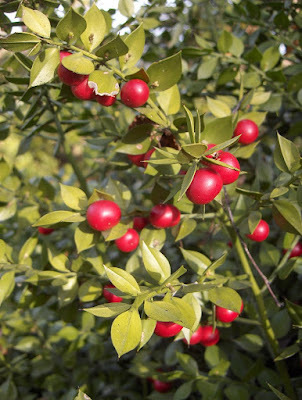 The butcher's broom comes into fruit after the floral bloom in autumn, and the cultivated plants are gathered at this time - for processing, sorting and sale. 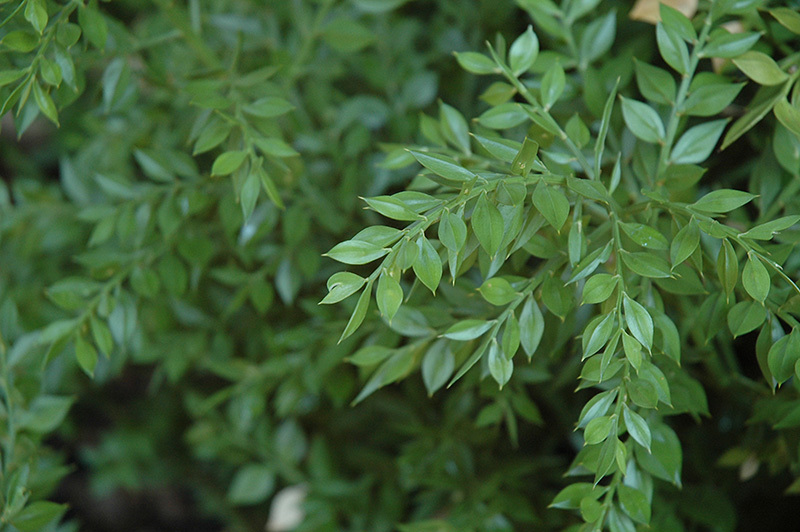 Butcher's broom is a plant. The root of butcher's broom is used to make medicine. Though the butcher's broom has many proven beneficial effects on disorders such as varicose veins and hemorrhoids, butcher's broom is not as widely used as it used to be before - the butcher's broom may soon regain its position as new evidence supports the remedial benefits attributed to it. The diuretic action and moderately laxative property of both the aerial shoots and the rhizome is attested in the herbal traditions of Europe, where the butcher's broom used to be extensively used in these roles in the folk medicine. Butcher's broom may cause stomach upset and nausea.